A closer look reveals there are still good reasons to hold this winner. With Netflix (NASDAQ:NFLX) stock up 75% in the past 12 months, some investors may be thinking about taking their profits. But despite the stock's impressive run-up recently, there are some compelling reasons not to sell this winner. Here are three. A key element of Netflix's success in growing its member base has been its bold moves to up the ante when it comes to content. The company's content library is getting better every year -- and not just marginally better, but far better. While some of Netflix's popular content today results from pricey partnerships with other content producers, the company's originally produced content is much more affordable given the user engagement it generates. Sure, Netflix Originals have higher upfront costs than the drawn-out costs of licensing content from other companies, but buy-and-hold Netflix investors know that the long-term benefits of producing more engaging content at a lower lifetime cost can't be overstated. The last few months have marked a significant ramp-up in the company's original content. Major Netflix Original titles released in the last few months alone include Marvel's Daredevil, Unbreakable Kimmy Schmidt, Bloodline, and Season 3 of House of Cards. Even though Netflix's international division is losing money today, reporting a $65 million operating loss in Q1, the segment will probably serve as a key for catalyst profits in the long term. When it comes to member growth, there is far more growth potential internationally than domestically. In the U.S., Netflix already has 40 million members. Meanwhile, total members in all other countries combined is just 20 million. As the company continues to ramp up its investments in growing its international footprint, Netflix will probably see a higher portion of revenue growth come from international markets. Indeed, the outsized opportunity internationally is already evident when comparing quarterly net member additions in the two geographic segments. Netflix's first-quarter net member additions in its international segment were 2.6 million, well ahead of its domestic net member additions of 2.28 million. Netflix's ongoing operating losses in international markets, primarily a result of heavy marketing spend and content costs as the company attempts to capture growth opportunities, should be only temporary. As Netflix establishes itself in new markets and international members continue to grow, its business model's operating leverage will help Netflix narrow international operating losses and, eventually, reach positive contribution margins. Sure, Netflix's international market may never reach the 40%-plus domestic contribution margin management is aiming to reach in the U.S. by 2020. But there's no reason its international markets won't begin to contribute meaningfully to operating profits once Netflix's international expansion costs begin to dwindle as a portion of total international subscriber revenue. 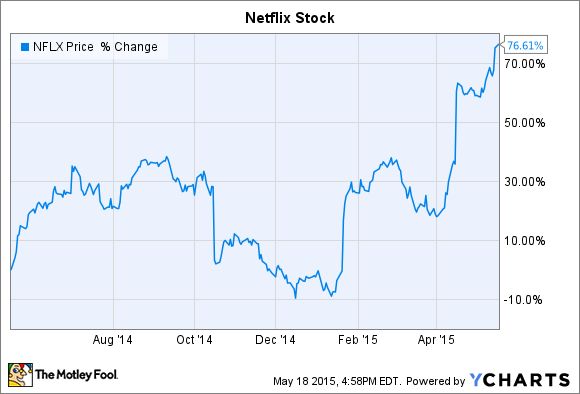 Investors should keep in mind Netflix's ambitious long-term aspirations. Management's big-picture vision is laid out simply on its website in a post describing its "Long-Term View." Apps are replacing channels, and screens are proliferating. As Internet TV grows from millions to billions, Netflix is leading the way around the world. Why is Netflix so certain that Internet-based TV is the future? Another excerpt from management's "Long-Term View" explains their thinking. New entrants like Netflix are innovating rapidly and driving improvements. Sure, Netflix's view of the future may be biased. But there's no arguing that Internet TV is growing rapidly in popularity, and Netflix is the unquestioned leader in the segment. Even if Netflix's view of the future turns out too optimistic, the company is poised to remain a leader in what is already a fast-growing segment of users who enjoy consuming Internet-based TV -- a segment already proven to be far more than a niche. Selling Netflix stock at the very point the company is proving it can remain a leader in this fast-growing, important category of the future of TV, even as the rest of the TV industry attempts to come online and offer a similar viewing experience formats, would be a mistake.